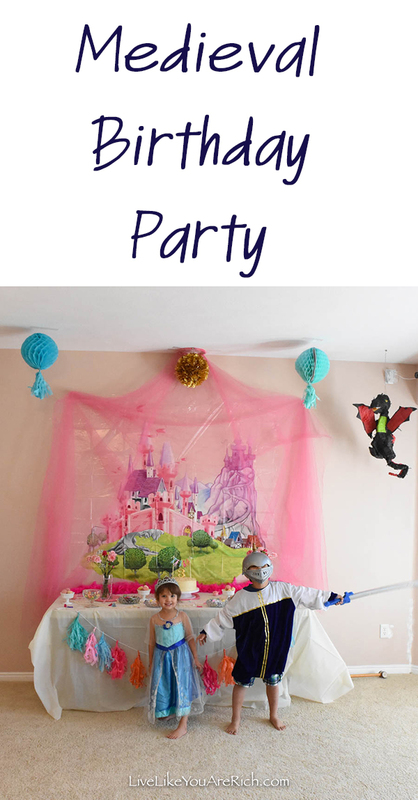 My daughter wanted a Medieval birthday party. I was thinking of fun and inexpensive party favors. I thought it would be nice to make DIY Medieval Snow Globes. 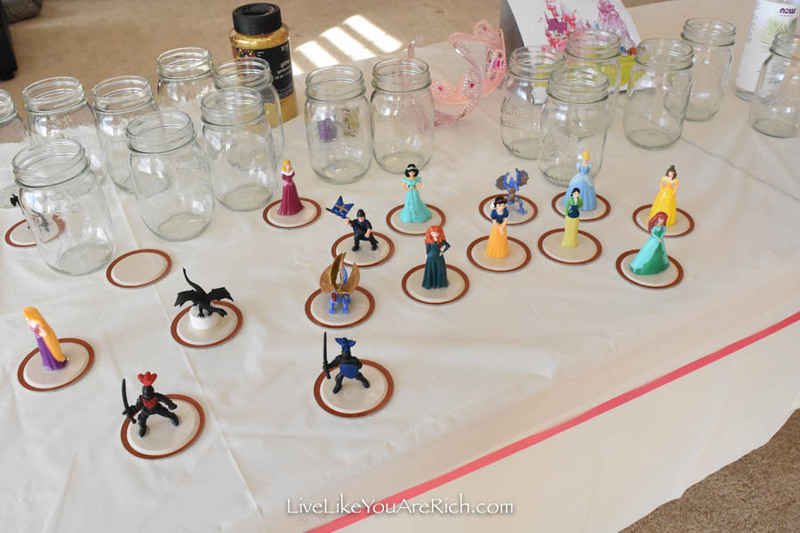 It ended up being a very easy, inexpensive, and quick activity that the kids loved. Among the crafts I thought of, the DIY Medieval snow globes were my favorite. The kids LOVED this party favor too. The snow globes took some time to make (which made the party time go by faster). 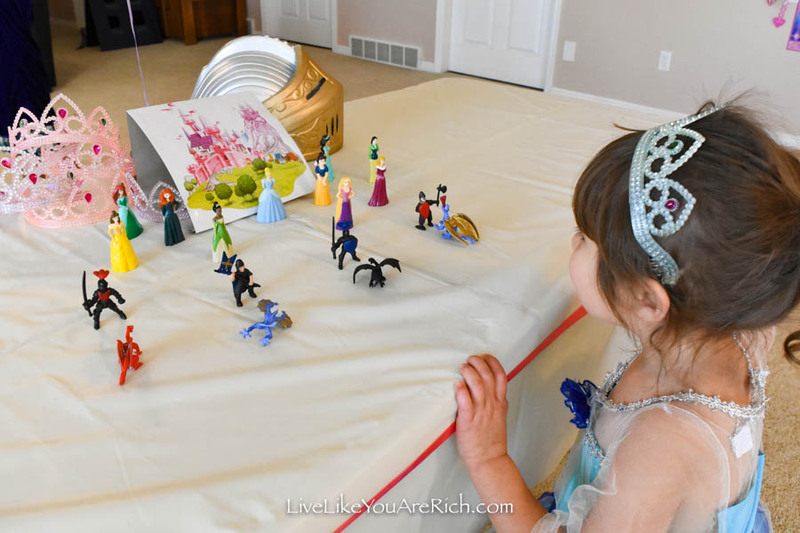 I liked how the kids were able to get creative (they got to choose their figurine and glitter and make the favor). 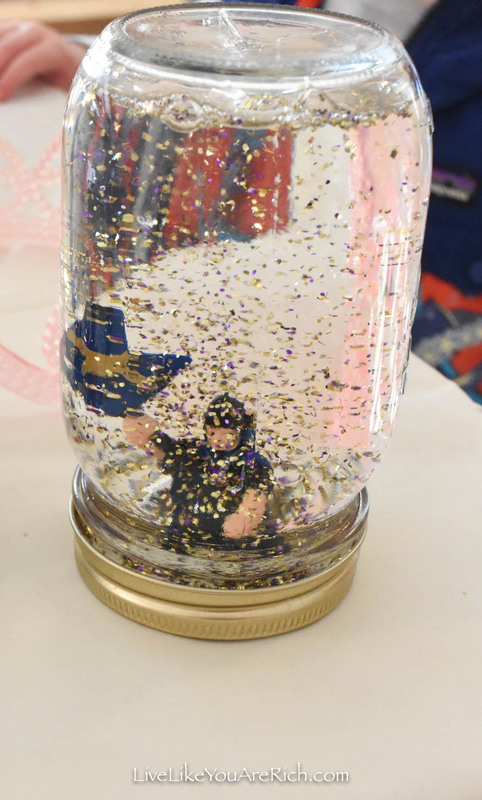 Some of the parents commented on the fact that they liked that the DIY Medieval Snow Globes were a unique gift/favor. They have held up really well! My kids still have their snow globes, they’ve withstood a few drops on the floor (are durable) and they work well with no leaks. I am writing this almost 1 year since doing this craft. 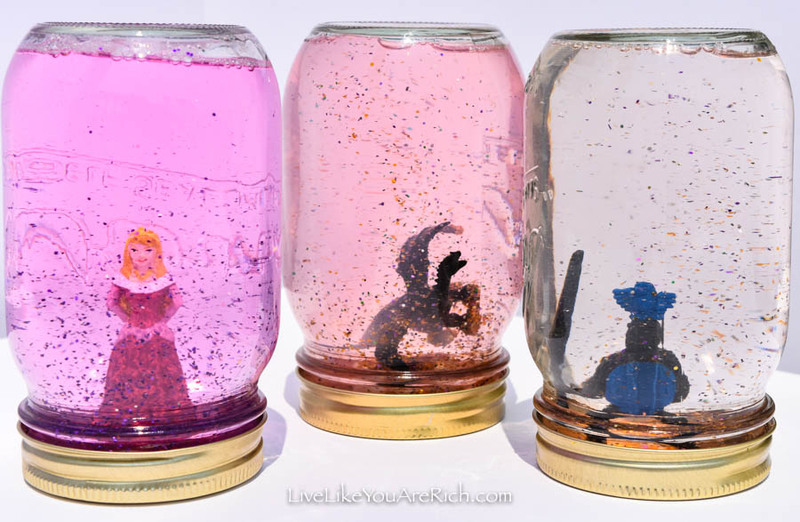 Below you can see 3 DIY Medieval Snow Globes almost 1 year since we made them. As you can see, even after a year of use, they are still holding up well. I had the glitter, mason jars, and lids. 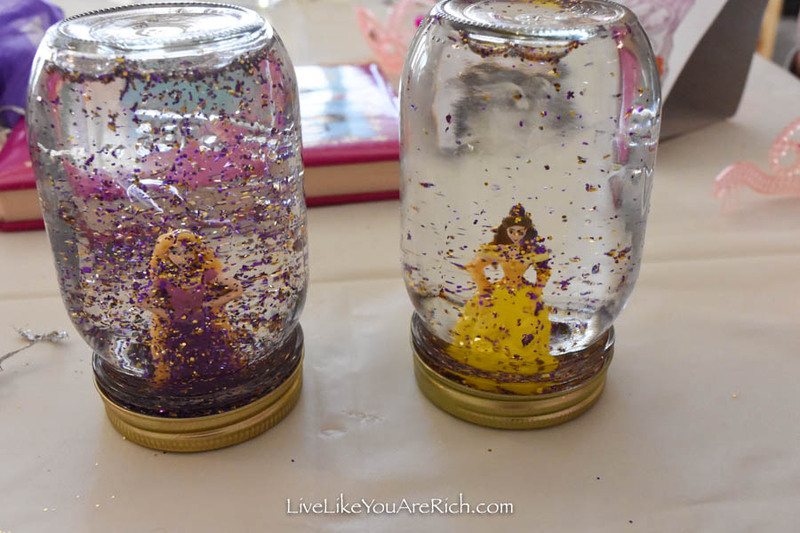 The figurines and glycerin and glue cost me total $32.00 so for 22 party favors that was not bad. It was just over $1.00 per kid. The Medieval Birthday party had a lot of fun aspects. We did jousting, crafts, hand puppet shows, hit a dragon pinata, and had cake and ice cream. Check it out here. special glue (1-5 minute epoxy general all purpose epoxy)—I should have bought 2 although I did stretch one and made it work. 2- Have the children choose their figurine. I had the birthday girl choose first and then it was whoever arrived at the party first, second, and so on. I had them pick one as they arrived. 3- Glue (with the epoxy) the figure down to the lid. 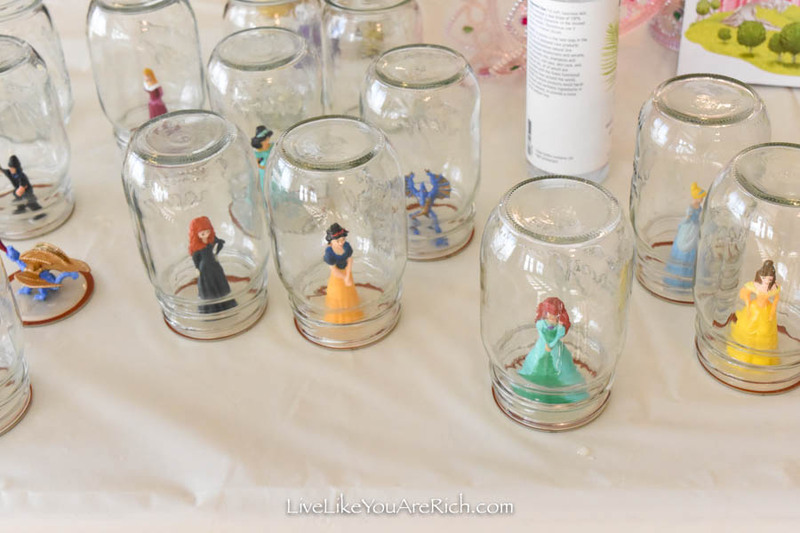 IMPORTANT- make sure that you put the jar over the figurine and mark where the figurine belongs in order to fit into the jar before the gluing; do this again after the glue is on and almost set but before it dries completely. This ensures that the lid will fit. Tip- Most of the dragons would not glue down but the boys decided they liked them better ‘flying around’. 4- Wait for glue to dry. I did a couple of the other activities found at this blog post while waiting. 5- After at least 10 minutes, fill the jar almost full with the distilled water (leave 1/2 inch for room for the figurine). 6- Put 4-5 drops of glycerin in the jar. The glycerin breaks up the water so it can move the glitter around and keeps it floating longer. 7- Have the kids pour in the glitter. You need about 1-2 Tablespoons. I just let each child do as they will. Some did multiple colors, others just picked one. 8- Put the lid/figurine in the water and see how much of an air pocket you have and add a little water to compensate. 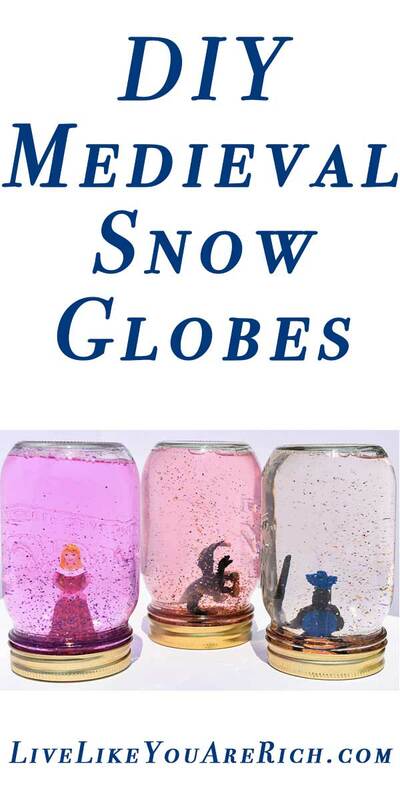 Snow globes work best when there is very little air (you don’t want a lot of bubbles). That said, I didn’t want water everywhere, so I did the best I could without letting the water and glitter spill out when I put the lid on. 9- Tighten the jars very tight. I had a man do this and we experienced no leaks. 10- OPTIONAL- I didn’t do this and we had no leaks, but you can create a jar bath (found at this post) to seal the jars for an extra tight seal. 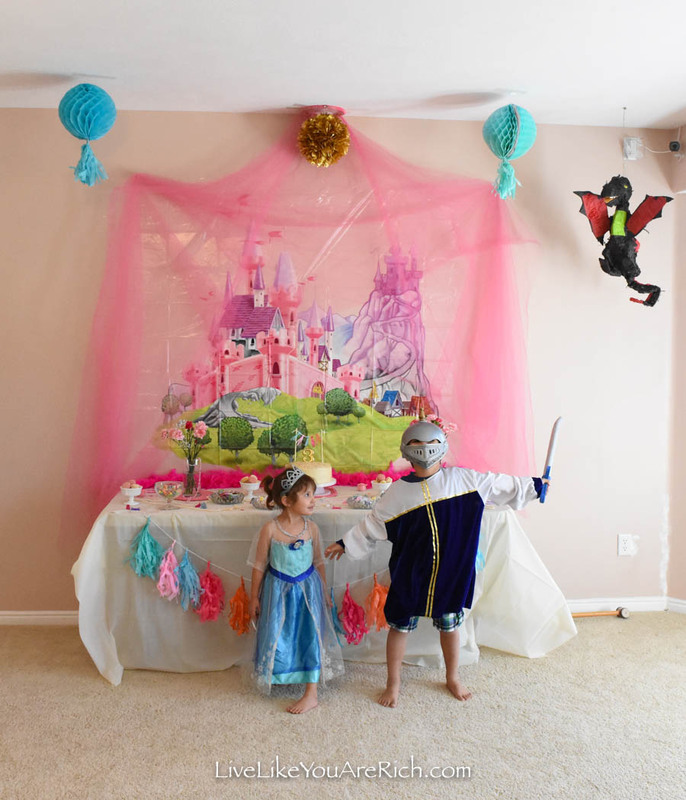 Tip– Using a dollar store waterproof table cloth that can be thrown out is helpful for glitter/glue clean up and minimizes mess when water is spilled. I hope you enjoy making these DIY Medieval Snow Globes as much as we did!